Are you in the search for the best tower heater on the market? Look no further! We've hand selected only the best models out there. Along with our comprehensive buyer's guide and in-depth reviews you'll be able to choose the best tower heater for your needs. There’s nothing worse than being cold but, what do you do when the air is chilly but not it isn’t quite cold enough to put the central heating on? 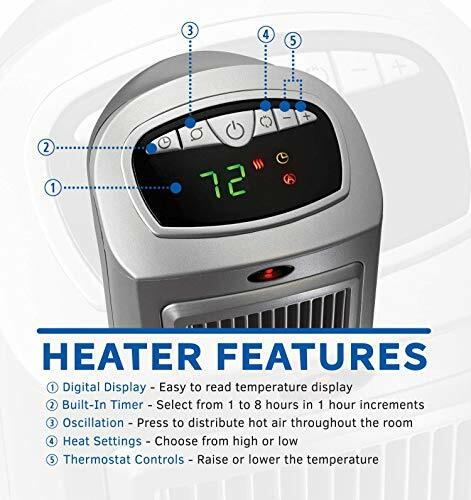 Or you want to heat just a small room, the garage or your RV (for a more in-depth look at portable heaters suitable for your RV check out our RV Heater Buyer's Guide and Reviews article )? Well, for these situations you might consider using a portable space heater. Portable heaters come in a variety of sizes, designs and fuel types and are excellent for those times when you just need a little additional heat. Tower heaters are portable, quick to heat and due to their unique style and design, ideal for pretty much any space. Their small footprint makes them great for smaller spaces and they’re efficient to run using your home’s electrical supply, a generator or in your RV. I already know about Heaters. Take me to the Reviews! Tower heaters are ideal for a variety of rooms and locations around your home, and have a compact, sleek, contemporary design. They offer a host of great features such as remote controls making them ideal for bedrooms – who wants to get out of a nice warm bed to turn off the heater? And oscillation meaning the heat is spread over a wider area. They are lightweight, portable and come in a range of sizes. In this article we are going to take you through some of the features you may wish to consider including those all important safety features, along with information on sizes and prices to help you decide if this is the right heater for you and, if it is, help you to choose the perfect model. Tower heaters are part of a range of different portable heaters, often called space heaters. They use electric to heat up ceramic plates, the heat this produces is blown out by fans, enabling the warm air to circulate around the room. Ceramic heaters are energy efficient and inexpensive to run, with durable parts that are hard-wearing and long lasting. Unlike most other space heaters, the unique styling of the tower enables them to be placed in small areas without taking up too much floor space. There are different heights with the smallest ideally suited to placing on tables or desks for a blast of added warmth right where you need it. They are generally lightweight and easily portable, often having handles integrated within the design, this makes them perfect for use in camper vans or simply to grab and move wherever and whenever you need them. Heat Output – what’s the heat output? Price – how much money do I want to spend? Placement – where am I going to be using it? Size – is the size of the heater important? Weight – will I have to move it from room to room? Features – what are they, and what am I realistically likely to use? Safety – what safety features are important? Tower heaters use electric as their fuel source making them convenient to use and generally inexpensive to run. Different sizes and models of these heaters will produce varying levels of heat. Heat output is measured in Watts with the higher the Watts usually indicating the higher the heat output. The heat output for tower heaters tends to be around 1500 Watts. But, don’t forget to take into consideration the size of the area you wish to heat. If it’s only a small office space or room that you wish to heat, buying a larger appliance may produce too much heat and will be costing you more money to run. Whereas a larger area would benefit from a higher Wattage output to comfortably heat the area and mean you could need only one unit instead of multiple units. If, however, your area is very large for example an expansive basement or office space (for commercial purposes you may wish to consider purchasing a heater which has been specifically designed for that use, these are usually constructed to withstand near constant use and will be available in a range of larger sizes to accommodate warehouses or bigger office environments.) you may benefit from having two (or more depending on the size of the room) heaters which can be placed to cover the area and provide a more even heat distribution. Details of a units Wattage will be displayed both in the description online and on the package, so it is easy to check between manufacturers to get the most suitable heater for your needs. There’s usually a choice of heat settings – low, high, maximum or energy saving options. Each manufacturer will have different heat settings so if having an energy saving option is important to you, then check their descriptions to see if it’s something they offer. Tower heaters make great little emergency heaters to have on hand, they can be used if your gas supply is interrupted, you run out of LPG or for almost any room in the house (and of course on the road too!). Because these heaters run off the electric it isn’t advisable to use them around water. Check the manufacturer’s manual for details of how to use them safely and where you can use them. Tower heaters vary considerably in price dependent on their size, heat output and features. They range in price from approximately $30 to $120. When considering which to purchase, think about the running costs as well as the initial purchase price. Some heaters may be economical to run for short periods but aren’t so efficient over longer periods. Electric tower heaters are generally considered to be energy efficient so are a good choice when considering which type of space heater is suitable for you. Tower heaters are just that, towers. Their clever design means the heater is tall and thin and so takes up very little floor space. Due to this unique design it’s possible to pop them into various locations around a room without having to move furniture etc. The various sizes include smaller models ideal for placing on desks or tables and the standard taller models which should suit most room sizes. These efficient little heaters come in a range of heights including small units which perfectly on a table top, counter top or desk. Taller models are designed to heat a whole room comfortably without taking up too much valuable floor space. Tower heaters tend to be lighter than their oil-filled counterparts and are less cumbersome to move around should you wish to use them in multiple locations. If you need to be able to change the areas in which you’ll be using the heater, look for models with integrated handles. Expect the weight of most units to be around 5lbs, making them highly portable and great if you plan on using them in different rooms. Easy to pop in your RV or trailer too. The features on these heaters have been designed to make them easy to use and economical to run. Some features you might use, while others are perhaps not necessary. So, before you purchase a heater, think about what’s important to you and what you’re likely to use. For example, some of these heaters have remote controls which is a great idea if you plan to use this at night in the bedroom. You can comfortably adjust the thermostat or switch off the unit without having to get out of your cosy warm bed. Ideal. But, if you plan to place one in the corner of your garage and once it’s on you forget about it, then paying extra for a remote control might not be necessary. Programmable – allows you the greatest control by enabling you to select the desired temperature. The heater will continually switch the heater on and off to maintain that temperature. Adjustable – are more basic and usually have a knob or buttons from which you can select either low to high. They do not maintain a set temperature and therefore can be more difficult to use if you want to keep a room at a certain temperature. Timers – enable you to programme when the heater turns on and off, great for energy saving, you can programme the unit to switch off when you leave or at night time. Digital Display – shows you information such as any programmes and heat settings. Touch Screen Display – allows you to quickly change the heat setting, oscillation etc. Remote Control – allows you to adjust the heat setting, temperature, timer, and oscillation for complete comfort and flexibility, all without having to get up from your chair or out of bed. Oscillation – sweeps the unit from side-to-side (some models allow full 3600 oscillation) allowing a greater heat distribution then a static heater will provide. You can decide whether to utilize this feature by selecting to have the oscillation on or off. With certain models you can also vary the speed at which it moves. Filter – protects the internal mechanisms of the heater by collecting dust and debris. 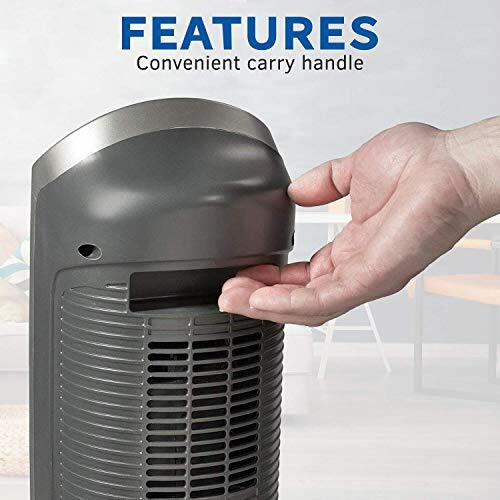 Carry Handle – allows you to carry the heater easily from room to room. As they tend to be lightweight, tower heaters are ideal for use in a variety of rooms or in your RV or trailer. If you plan on moving your heater often, look for those with neat, integrated carry handles. In general tower heaters are extremely safe, but they are a heat source and as such there is the potential for accidents to happen. For this reason, there are several safety features available depending on the manufacturer and model that you select. When considering where you place any heater, it is vital that you opt for a location that is away from any fabrics or objects that might obstruct the heater. Never place clothes or items on top or over a heater and opt for a location where small children or animals cannot touch or knock over the heater. Always refer to the manufacturer’s instruction manual for full details of the correct use of their heaters. Automatic Overheat Protection – if there is a fault the unit will switch-off. Tip-Over Switch – prevents the heater from tipping over and causing a fire hazard. Safety Motion Sensor – detects if objects are too close and will automatically switch the heater off, when the item is removed, the heater will switch back on. Cool-Touch Exterior – the exterior has a cool-touch ensuring safer handling and operation. Always keep young children and pets away from heat source. Refer to the manufacturer’s manual for the correct use of their product. CSA Certification – any heaters with CSA Certification have undergone rigorous external testing outside of their own companies’ stringent testing. This ensures customers receive a high-quality, well-constructed, and safe product. Lasko needs little introduction as I'm sure many of our readers would of heard about them. They are an American made company that produces heaters, fans and more. Want to read more about Lasko heaters? Be sure to check out our reviews of even more Lasko products. Remote needs a short and unobstructed path to work. Temperature output can sometimes be higher than set by a few degrees. A great ceramic tower heater from a well respected company. Wins our award as the best tower heater you can buy. Yes, another Lasko product. Can you guess what our final best tower heater option will be? This is another ceramic tower heater with a digital display and remote control. An ideal heater for the living room, office or kitchen to name just a few places. Tends to heat a few degrees warmer than set. Lasko again?! Yes, you guessed it. 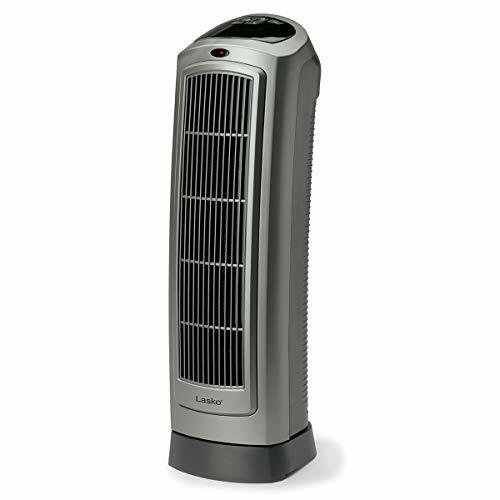 Topping off our list in this best tower heater buyer's guide is the Lasko 755320. We were hesitant at adding this to our best tower heater lineup as a few members have complained about safety risk. However, the product still has a good overall rating which is why we have included this heater. Tendency to not cut off at required temperature. 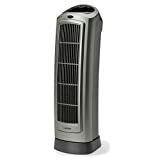 One of the most popular tower heaters from Lasko.